Pineapple lovers! 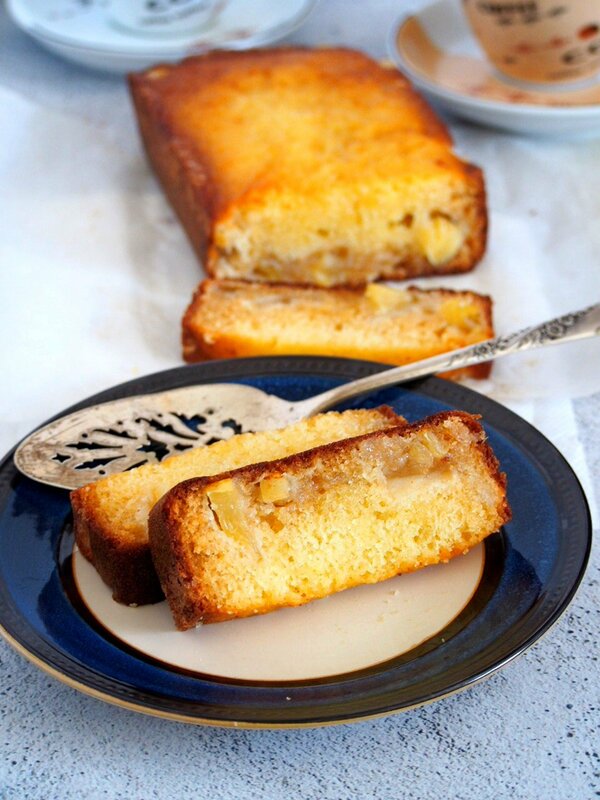 This Pineapple Loaf Cake makes the sweet and juicy fruit truly shine. Every slice, moist and tasty, is sure to delight. Hello! I am sneaking in on a Monday for an easy baking session for you all. You have canned pineapples? Eggs? Milk? Brown sugar? Great, then. 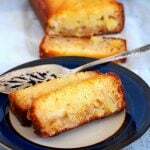 Let us make Pineapple Loaf Cake. 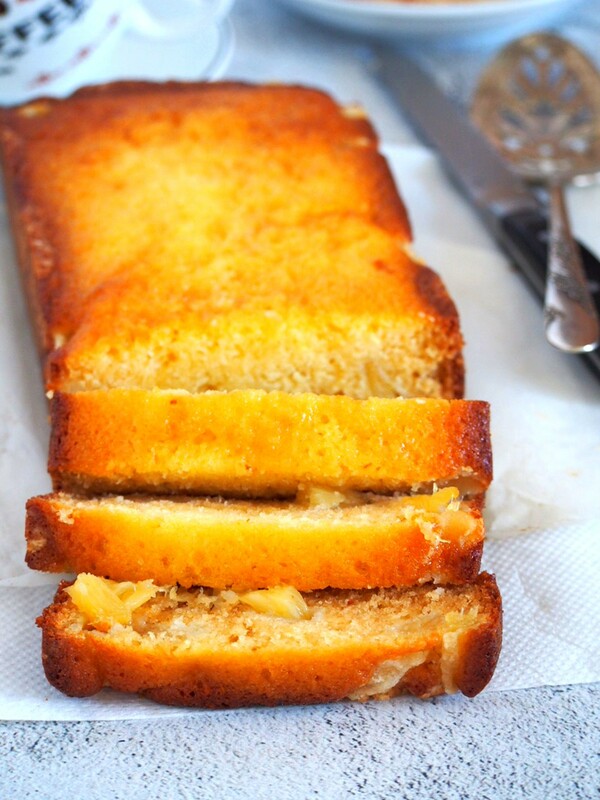 This is a simple cake you can squeeze in so you have that delicious weekday cake slices for dessert. 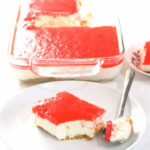 Or if you have guests suddenly coming over, you can make this cake to make sure you have dessert on the table as you work on the rest of your menu. Won’t need much of your attention, promise. 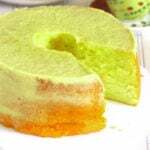 The cake is sweet and moist with tender-crisp edges. The pineapples, sweet and buttery, hidden inside. 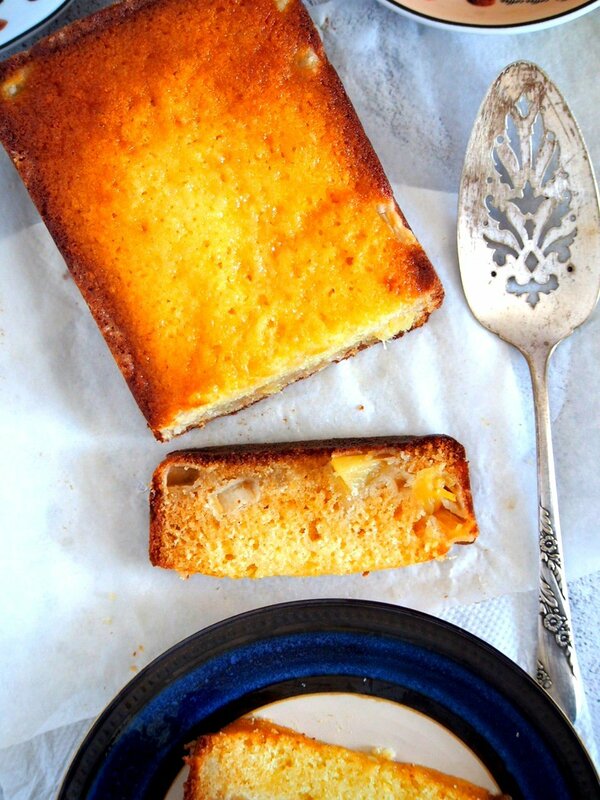 This pineapple loaf is a sweet little gem. One that you can keep on your easy baking rotation. We are using canned pineapples for simplicity and ease because honestly, I do not have time to skin a fresh pineapple at this stage of my life. Plus, we are gonna use some of that pineapple juice in the can, too. This cake requires no more than stirring the ingredients together. All the dry stuff first, then the wet. The pineapple mixture gets added last, sprinkled on top of the mixed batter. I admit I was hoping that the pineapples will somehow remain on top as the cake bakes, but for some reason, they don’t want to do that. They want to get sucked into the batter. And they are firm with that, even after my second, third, fourth try. So I made peace with that. 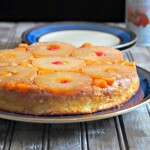 The pineapples become nestled in the middle, bottom, top, everywhere in the cake. And I think it is more delicious that way. 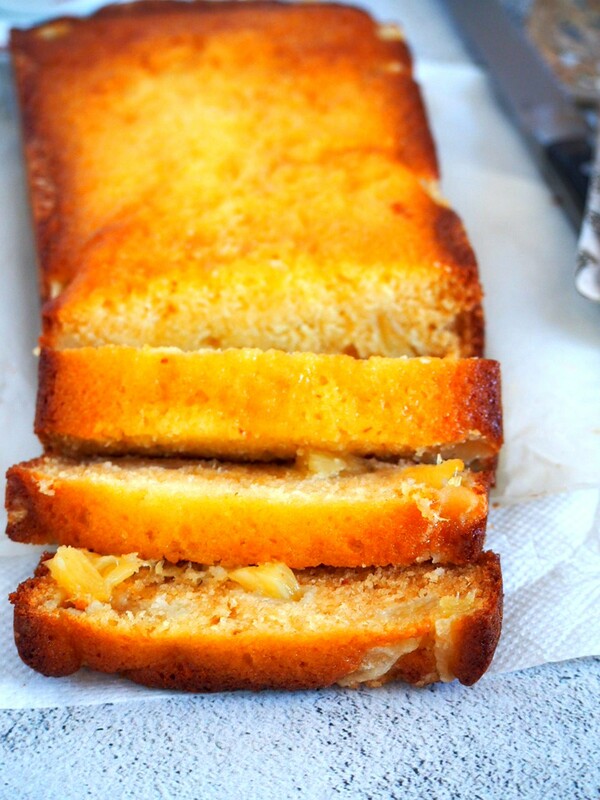 So here you go, a cake so easy to make, and so easy to finish. This Pineapple Loaf is gone the next day in our household. It is not too big of a loaf though, but every slice is sure loaded with flavor, and pineapples. 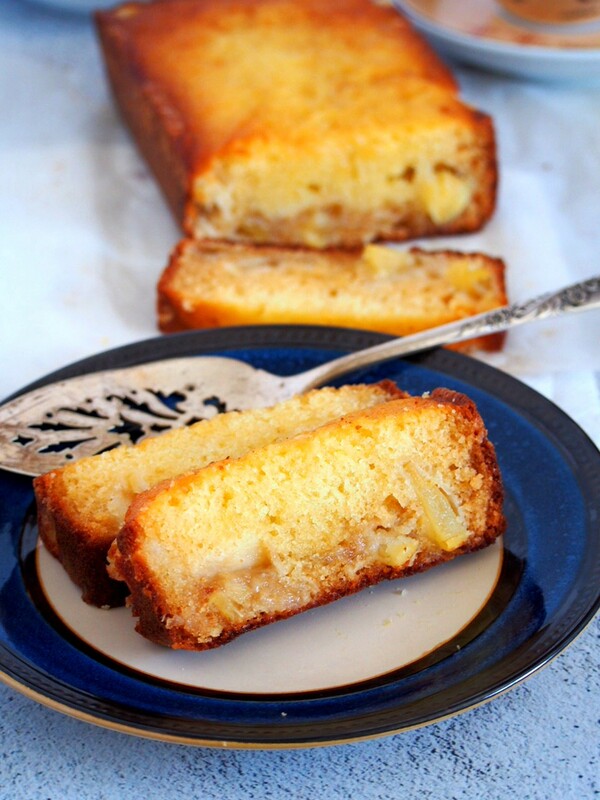 It is that sweet, buttery and fruity kick that makes this cake such a hit. 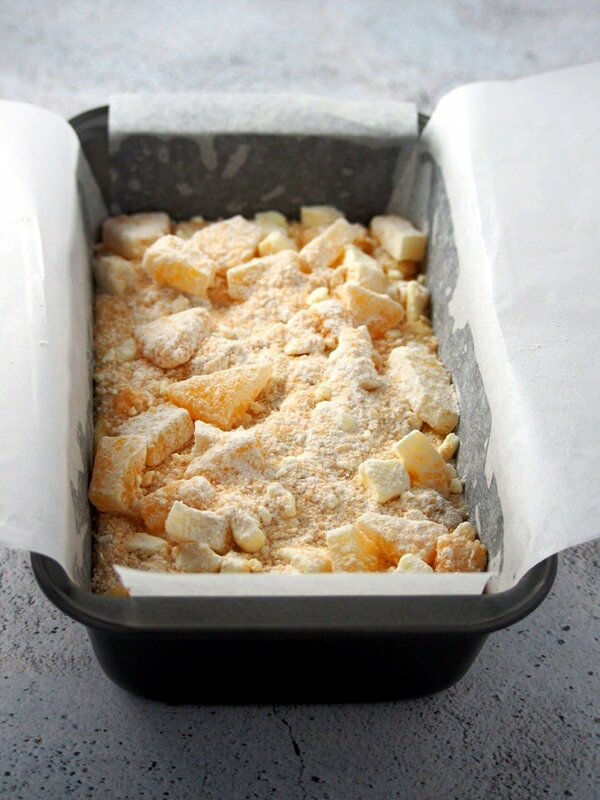 Use the canned pineapple chunks and not the crushed ones. The crushed ones tend to clump together during baking and they somehow do not taste very much like pineapples when they do that. Cover the cake loosely with foil after the first 15 minutes of baking. This prevents over browning of the cake. Instead, you will get those tender caramelized edges which I love. Ovens vary, so make sure to check the cake around the baking time guideline in the recipe. Once it is set and the edges have pulled away from the pan, it is done. A toothpick inserted at the center should come out clean. 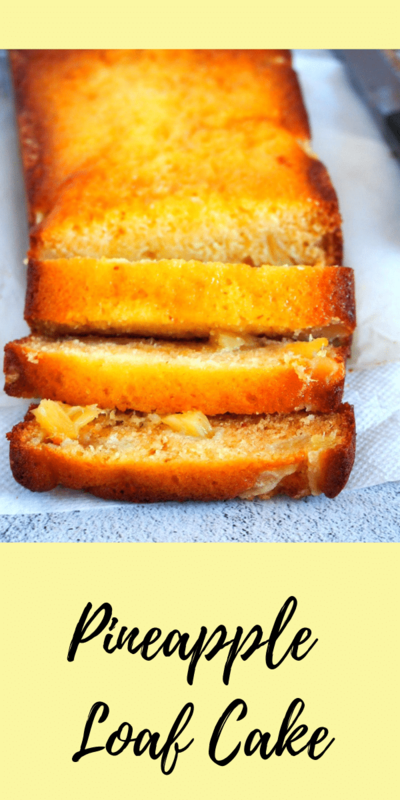 This Pineapple Loaf Cake will delight the pineapple lovers out there with the moist and tasty cake filled with pineapple chunks. Preheat oven to 350 F. Line a 9x5 inch loaf pan with parchment paper. Whisk together all the dry ingredients in a mixing bowl: Flour, baking powder, baking soda, sugar, and salt. Stir in the melted butter, milk, eggs and pineapple juice. Stir everything together until it is smooth. Pour the batter into the prepared loaf pan. 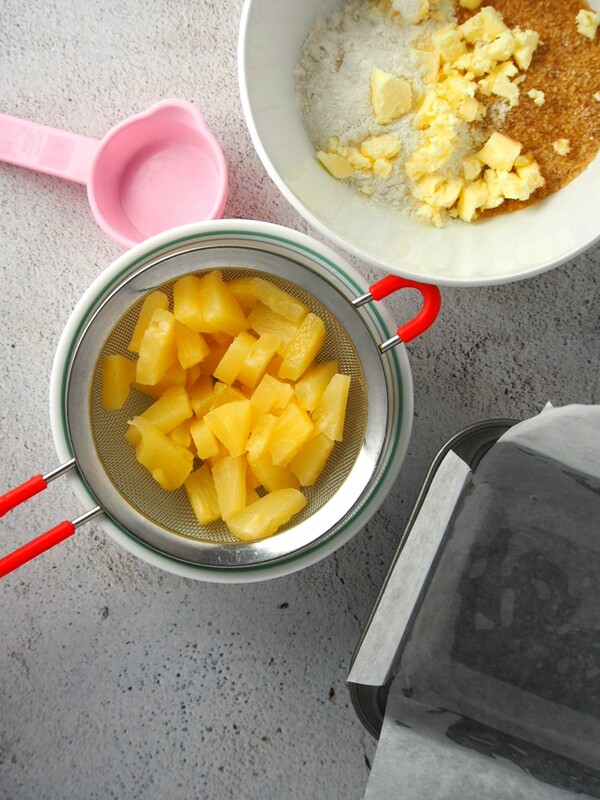 Stir all the ingredients for the pineapple mixture in a separate bowl. Sprinkle the mixture on the cake batter in the pan, distributing it evenly. Bake the cake at 350 F for 55-60 minutes, or until a toothpick inserted at the center of the cake comes out clean. 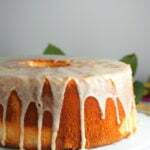 Cover the cake loosely with foil after the first 15 minutes of baking to avoid over-browning.